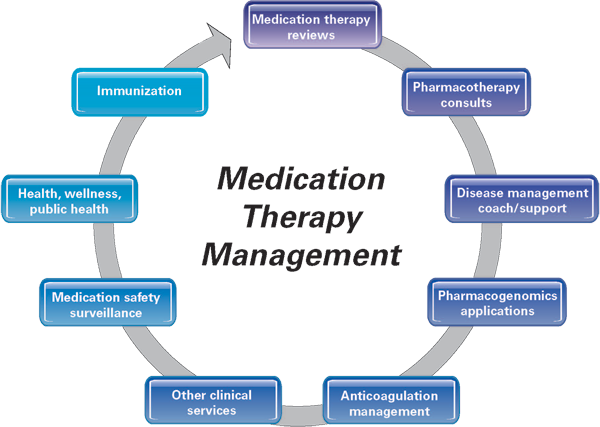 As defined in a consensus definition adopted by the pharmacy profession in 2004, medication therapy management is a service or group of services that optimize therapeutic outcomes for individual patients. Medication therapy management services include medication therapy reviews, pharmacotherapy consults, anticoagulation management, immunizations, health and wellness programs and many other clinical services. Pharmacists provide medication therapy management to help patients get the best benefits from their medications by actively managing drug therapy and by identifying, preventing and resolving medication-related problems. Pharmacists provide medication therapy management services in all care settings in which patients take medications. While pharmacists in different settings may provide different types of medication therapy management services, the goal of all pharmacists providing medication therapy management is to make sure that the medication is right for the patient and his or her health conditions and that the best possible outcomes from treatment are achieved.